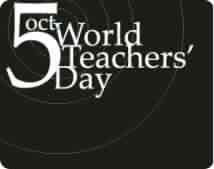 October 5 is a big day for us teachers because the entire world gets to recognize our importance and efforts. Our school alone had rendered a program for the faculty and our students had prepared their tributes of dance, songs and gifts and we could only be warmed by their efforts. burdened with monstrous piles of test papers, draining lectures, mind - soul boggling fail - or- pass grades, erring students, countless blackmails and death threats, unsolicited parent reprimands, supervisor's memo's, demotivating school policies and way too cheap paychecks, TEACHING IS NEVER AN IDEAL JOB!! !But, when students say,"Thank you!" or when they recognize you after they graduate, or when they get you as their ninang or ninong, all the hard toils of teaching are vain with the appreciative smiles of parents and students whom you have touched in a very distinct way. So, HAPPY TEACHERS DAY to all educators!